This is a great book that I would read on the first day of school to all students in kindergarten to sixth grade. It gently reminds students that the things they say can hurt other people. 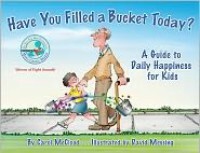 So, in order to drive this point home, after reading this book I would have students fill each other's buckets, literally. In order to do this, I would place a small bucket, or box, for each student in the back of the room and then have a station set up beside it with sticky notes and pencils. I would then challenge my students to write something nice about each other on the sticky notes and drop then in the person's bucket throughout the day. This way the students are literally filling each other's' buckets with encouraging words daily. However, instead of letting the students see what was placed in their buckets at the end of the day, I would probably type up all of the notes to give the students the next day. This way I could make sure nothing mean was placed in each bucket, but also the students would not know who wrote what.